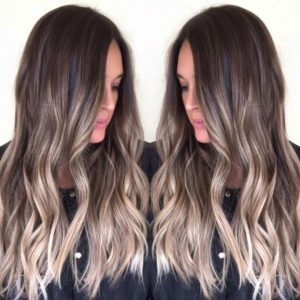 As the subtle, more sophisticated sister of ombre hair color, balayage highlights have been one of the most popular trends in hair color for the past several years, and with good reason. 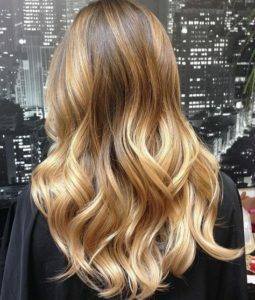 Applied using a hand painted technique that mimics natural highlighting, balayage highlights are a step up in sophistication, and can vary from subtle to bold. 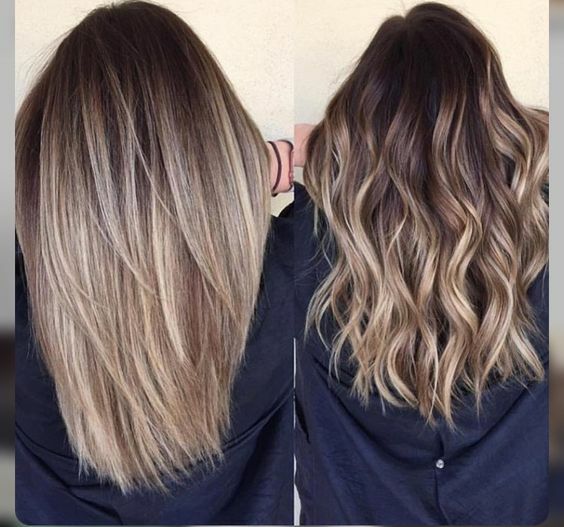 Whether your hair is an ashy brunette or warm auburn, blonde balayage highlights can instantly elevate your one-dimensional hair color, and instantly make your style brighter looking in time for warmer weather or a special occasion. Having an experienced colorist give your hair the blonde balayage treatment will ensure the correct placement and color choice, but once these highlights are in place they don’t require frequent touch ups, and you can let them grown out for as long as you’d like. 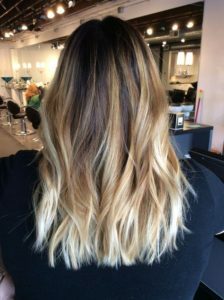 Get ready to get a little (or a lot) more blonde in your life after you check out our favorite blonde balayage hair color ideas. 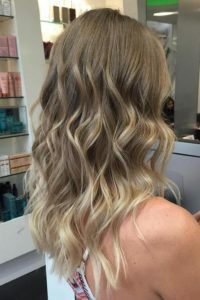 With a buttery blonde balayage applied liberally over darker blonde hair, this hairstyle strikes the perfect balance between trendy and natural looking. 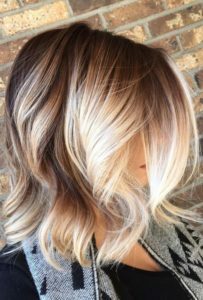 If you’re looking for a blonde balayage color that won’t contrast too boldly against your natural medium brunette hair, try a darker shade of toffee blonde. 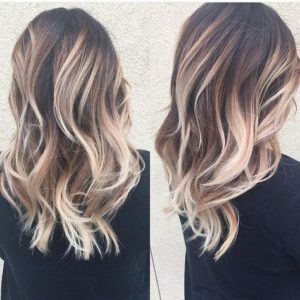 These two colors together look good enough to eat, and make a nice warm style for cooler seasons. Looking for a two-toned hairstyle with tons of visual impact? 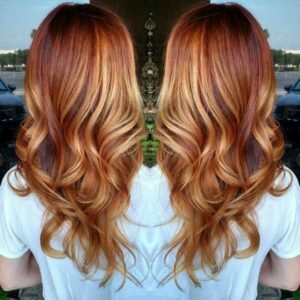 Brighten up red locks with blonde balayage highlights that take your autumn colored hair to a sunny summer shade. More than just a hint of blonde, this golden blonde balayage creates a rich looking style when worn over natural auburn hair. 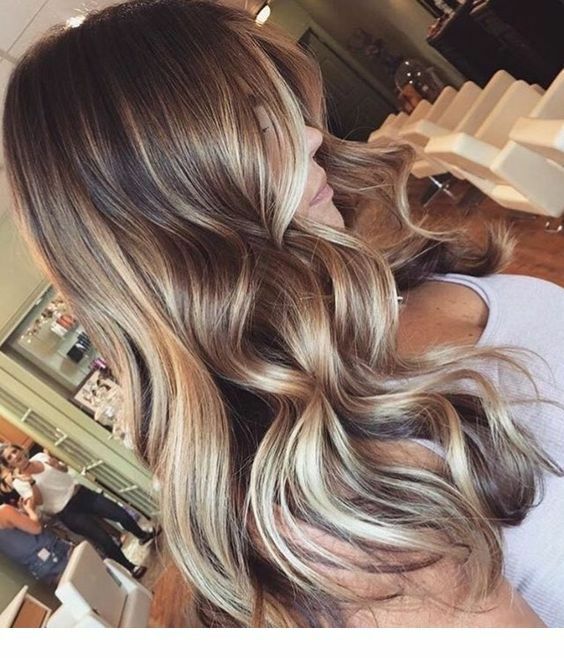 These balayage highlights grow out nicely, making them easy to wear with long periods of time between touch ups. 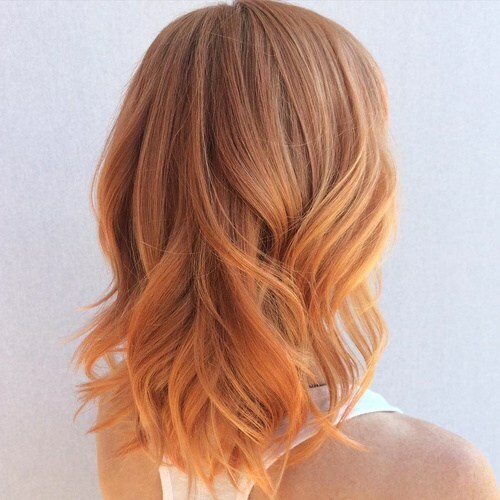 A bold blonde balayage helps to accent the thick waves that have been styled into this auburn lob, and make for an extra playful addition to your dark red lob. 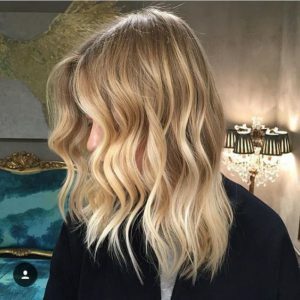 Featuring balayage highlights in a golden blonde shade over a darker, natural looking blonde, these golden waves make for a sunny style that will have you looking ready for a California summer no matter where you go. 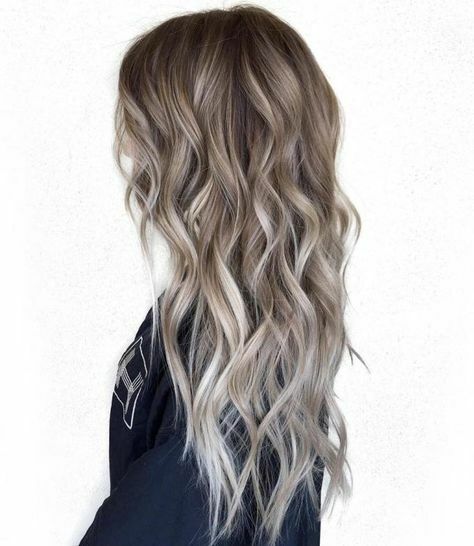 Cool things down by layering this ashy silver blonde shade over brunette hair that’s equally ashy with no red undertones. 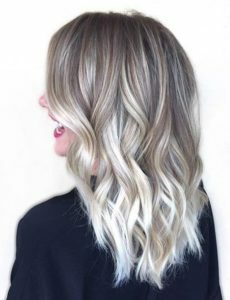 The end result is a hair color that’s trendy and polished but with a little edge, perfect for ladies with cool complexions and light colored eyes. Look like a perfect frosty snow queen with this icy combination of ashy roots and wintery white blonde balayage highlights. 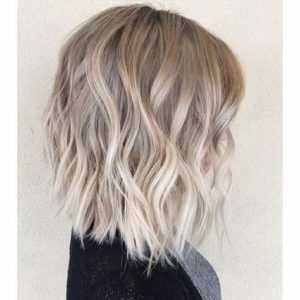 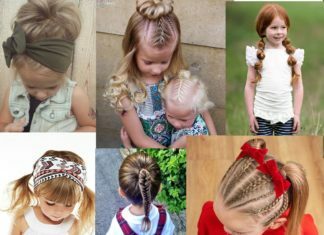 We love this look for porcelain skinned beauties who aren’t interested in going brunette, and this style definitely proves that colder weather doesn’t have to mean your hair gets darker. Looking to warm up your hair color in an easy, low maintenance way? 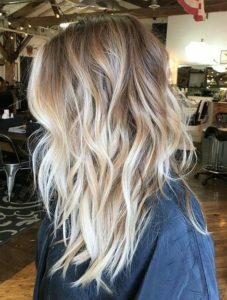 Keep it low-key and natural with this warm blonde balayage that’s only a few shades lighter than the rest of your hair. Going for a bold contrast between colors like these deep auburn and buttery blonde shades can be a bit of a hair color risk. 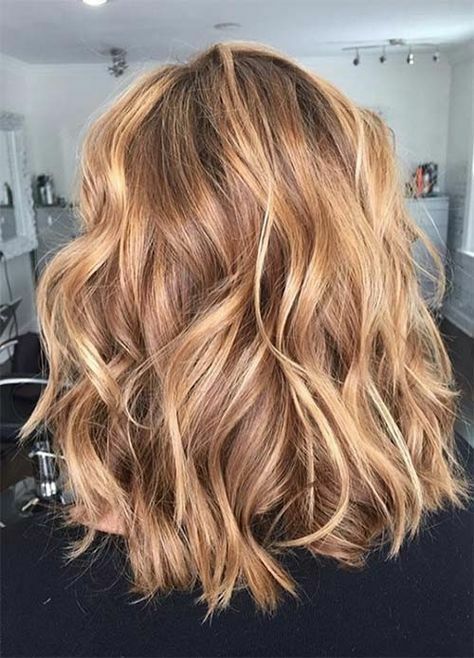 What makes this style work are the matching warm undertones in each color, that help to make this look pop on warm skinned women, especially those with green eyes. If you’re looking for a blonde balayage hair color that’s a little more unique, try this sweet and sunny strawberry blonde style that’s a natural looking addition to anyone who was born a redhead, or with brunette hair that has red undertones. With quite a strong contrast between a dark natural brunette and the warm blonde balayage highlights, this multi-tonal style looks best on women with medium or deep complexions and warm undertones. 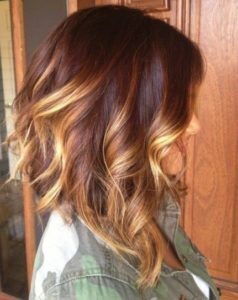 Although balayage highlights tend to be seen most often on longer hair, they work with shorter styles too. 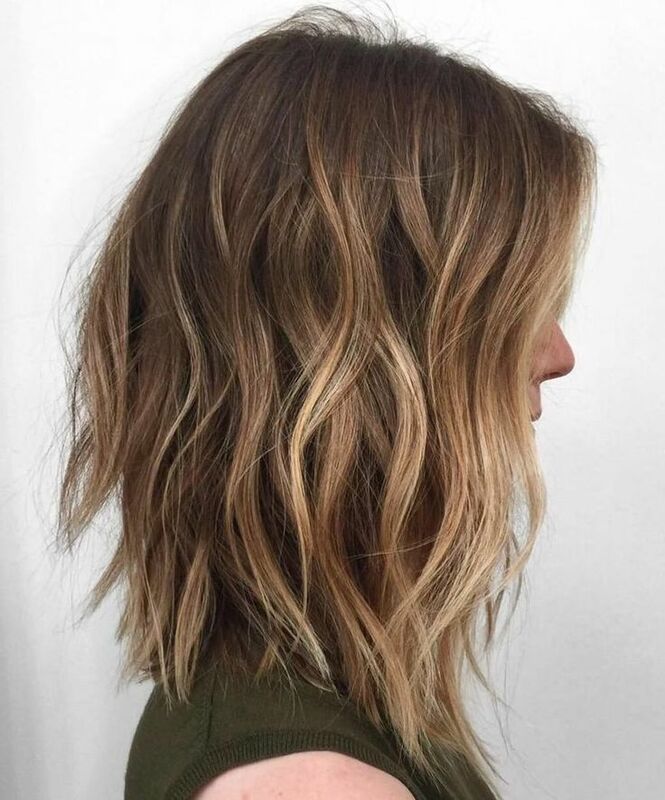 A dramatic blonde balayage helps to elevate this long bob style from similar haircuts worn with one dimensional color. 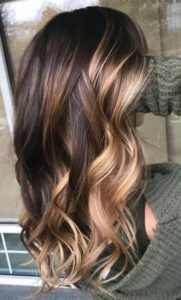 Warm and mellow like a toffee flavored latte, this golden balayage color fits perfectly with a muted natural auburn with subtle hints of red throughout. If you like your blondes without any hints of yellow, try this ultra light shade of ashy platinum for your next set of balayage highlights. Worn over a darker brunette root, this balayage style reaps the rewards of going for a bold look. 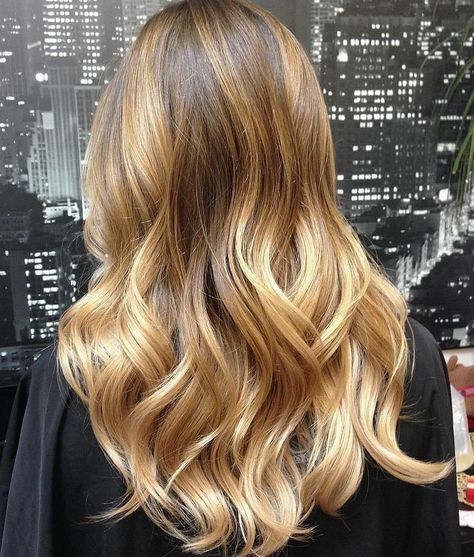 If beachy hair won the lottery and bought a mansion, the result would be this rich golden blonde balayage style. 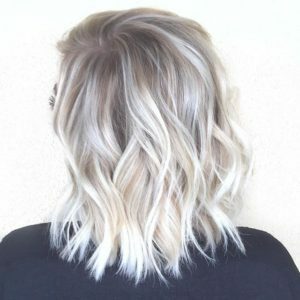 This creamy, dreamy look is one of the most mature and expensive looking ways to get glowy summer hair, and is perfect for put together women who are well past their basic blonde stage. Whether you call it white hot or icy cool, this ultra light blonde balayage is the result of a trained professional stylist working their magic. If you’re looking for equally impressive white blonde highlights, be sure to trust your color to a stylist who knows how to lift hair to this perfect pearly shade. Ciara’s perfectly positioned caramel balayage highlights do an incredible job of framing her face, and make this a perfect look for any season. Grab a slice of pale blonde perfection with this buttery shade for your balayage highlights. 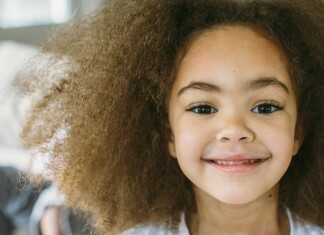 A color this pale can help to make even the fairest of complexions look rosy in comparison. 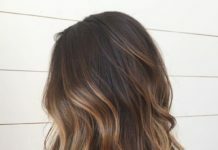 With a warm honey blonde over a darker brunette shade, this dimensional color is the perfect way to add a lighter color to your look if your complexion is deep or olive. 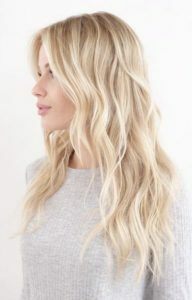 This look strikes the perfect balance between a full head of blonde hair that can make olive complexions look yellow, and an all natural brunette that feels flat and one-dimensional. 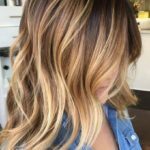 We love the idea of dressing up your red hair with blonde highlights, and the balayage technique helps to create color palettes that remind us of autumn leaves or the glowing embers of a fire. 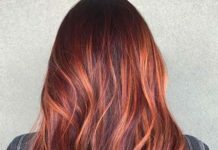 Whether you’re gearing up for summer or winding into fall, this rich warm style will breathe new life into your red hairstyle. Working on a canvas of natural black hair, this balayage style features multi-tonal blonde color for a finished product that will have everyone begging to know who colors your hair and how soon they can get an appointment. 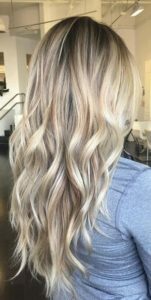 This champagne colored balayage is certainly something to celebrate, and manages to look chic and expensive while staying fun and flirty. 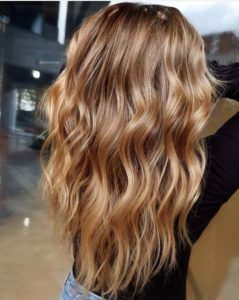 Although there’s certainly nothing average about supermodel Gisele Bundchen, her beachy blonde balayage looks like a quintessential summer highlight job helped along by the sun. With hair this long you have more than enough canvas to make a bold balayage statement. 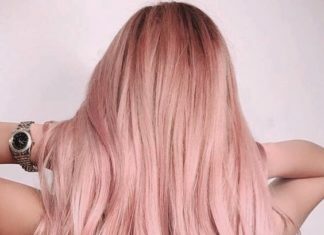 This dirty blonde shade is a little more grown up looking than some of the brighter blondes on our list, making this a great choice for women who aren’t looking to turn into a bubbly bottle blonde. 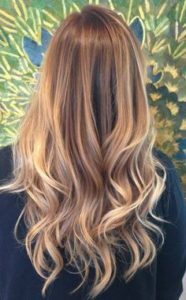 The color contrast between deep auburn hair and these golden blonde highlights makes it one of the bolder styles on our list, and looks best on women with warm, medium complexions. Keep your hair color looking natural by adding a subtle blonde balayage over your dirty blonde locks. Perfect for sprucing things up for a new season without going for a complete color overhaul. 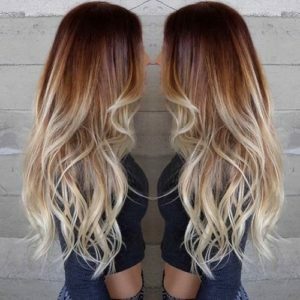 Have you been dying to try blonde hair, but aren’t sure if your deeper skin tone will be complimented by the look? 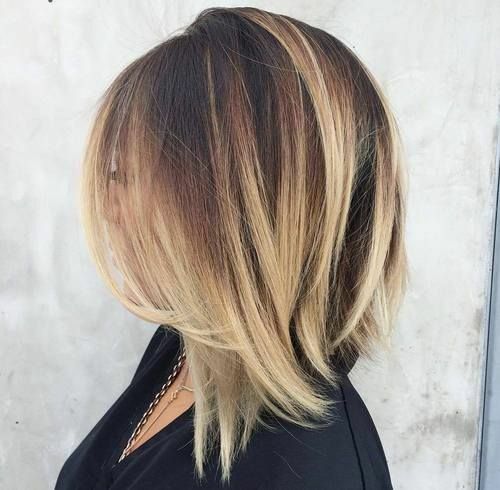 Blonde balayage highlights like this golden caramel style are the perfect compromise, allowing plently of darker hair to help balance and control the style, and creating a rich color palette that’s more fun than a single tone look. This blonde balayage style is sweet, subtle, and perfect for ladies who want to beef up their hair game while letting their low maintenance style fly under the radar. 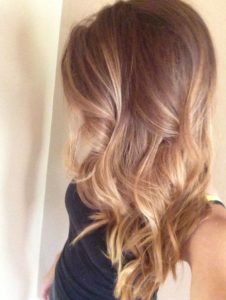 This natural shade of blonde does an incredible job of mimicking natural highlights in terms of both color and placement. Model Lily Aldridge likes to keep her hair a fairly dark shade of chocolate or espresso, but has become a modern trendsetter with the golden and caramel highlights that often accompany her dark locks. If you’re looking for a new shade of blonde for the hot summer season, this rich warm caramel balayage style will definitely spice up your summer look! 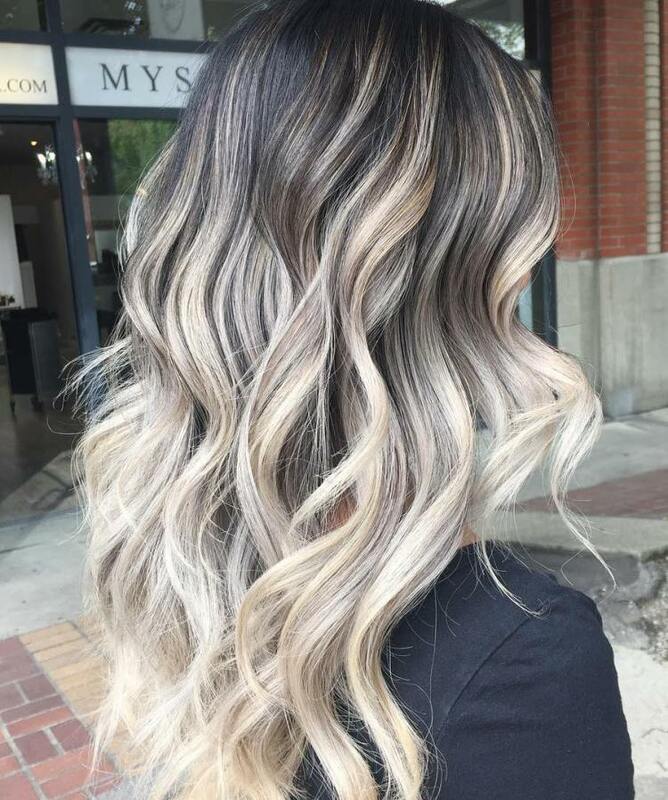 This gorgeous balayage style features multi-tonal blonde color on a fairly dark base, creating a super chic and sophisticated look! If you like your blonde warm and shiny, you should definitely try this sandy shade of warm blonde for your next balayage look. Look at this stunning brown balayage style! 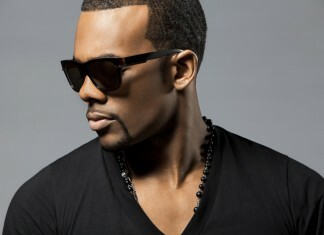 A chocolate brown base with golden highlights mostly at the front and a little at the lower back of the strands. A multidimensional and super glamorous balayage! Rose gold is one of the hottest hair trends right now and its a great color for spring and summer time! 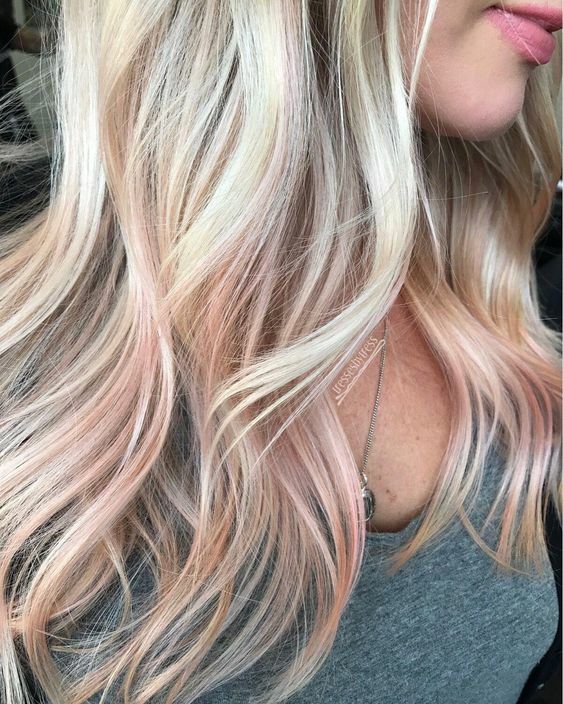 This blonde balayage features subtle peach and rose gold undertones, creating such a beautiful look!